The WSJ has an interesting article today on the Target credit card security breach. As the article notes, the US card system is less secure than elsewhere in the world, most notably Europe, which has a “chip and PIN” system, which has a computer chip embedded in the card and requires the purchaser to insert a PIN as well to make a transaction. The Target security breach has led many to wonder–and implicitly the WSJ–why the US has lagged on adopting this more secure technology. Well it turns out that the economics of credit card security is more complicated than it appears at first glance. But first, an important thing to keep in mind: historically the United States has been a high-trust, low-fraud country when it comes to payment card usage. For example, the conventional practice of handing over your credit card (or debit card) to a waiter in a restaurant and having him disappear into a back room with it is something that must strike people in other countries as somewhat bizarre. Nevertheless, we do it all the time and rarely does anything go wrong in this process. So, this makes a difference–in a high-trust, low-fraud country it generally is not necessary to invest in as elaborate security protections as elsewhere. As an analogy, consider that in the U.S. very few restaurants, stores, or hotels routinely post visible armed guards at their front door, whereas this precaution is not uncommon in other countries. With that background in mind, the WSJ article contains some interesting numbers relative to the optimal level of credit card security. This book, by journalist Charlie Savage was published six years ago, but I just finished it. It’s a well-written, well-researched critique of the George W. Bush’s Administration’s abuse of executive power based on often extremely dubious constitutional theories. If you’re interested in the subject matter, it’s well worth reading, despite its age. Of particular interest to many VC readers is that he traces the intellectual origins of the Bush Administration’s broad assertions of executive power back to (mostly) young conservative lawyers who worked in the Reagan Administration. I have a few qualms about the book. Most important, for a book that’s all about executive power, you’d hope the author would master what the theory of the unitary executive means, and wouldn’t, as so many Bush Administration critics did, confuse that theory with other issues. Savage, unfortunately, fails that test repeatedly. Savage also sometimes overstates his case, especially later in the book. For example, Savage notes that Bush issued signing statements indicating that the Administration would decline, for constitutional reasons, to enforce affirmative action preferences in government employment dictated by statute. Savage claims that Bush did so despite the Supreme Court’s holding in Grutter that affirmative actions preferences are constitutionally permissible. Savage indicts the administration for ignoring Grutter in favor of its own interpretation of the Constitution. In fact, Grutter only held that preferences in higher education are permissible. While some scholars think that Grutter’s logic can be applied to employment (I’m not one of them), Grutter didn’t purport to overrule cases unfavorable to preferences, in particular the Adarand case, banning preferences in government contracting. In this instance, I think Bush had the better of the constitutional argument based on Supreme Court precedent, but at the very least Savage significantly overstated the case that Bush was acting lawlessly. “It is a Canadian tradition to stand for what is principled and just, regardless of whether it is convenient or popular,” he said to the Israeli parliament. Thursday, January 22: I will be delivering the annual Brennan Lecture at Oklahoma City University. My topic (picked because it interested the organizers) is “NFIB v. Sebelius and the Constitutional Debate Over Federalism.” Perhaps Justice William Brennan would turn over in his grave if he knew that I was giving this lecture. There are important areas of agreement between us, but probably not on this issue. On the other hand, he might already have turned over when co-blogger Randy Barnett delivered a previous lecture in the series in 2004 (the list of past speakers also includes many people closer to Brennan’s views). Jan. 27, noon: University of Chicago Law School Federalist Society: I will be doing a talk on my book Democracy and Political Ignorance: Why Smaller Government is Smarter (with commentary by a U of Chicago professor, name TBA). Jan. 28, noon: University of Illinois College of Law Federalist Society, Champaign, IL: “Democracy and Political Ignorance,” (with commentary by Illinois Prof. Jason Mazzone). There is widespread agreement that political freedom is a fundamental human right – that everyone is entitled to substantial freedom of choice in deciding what type of government policies they will live under. This is one of the main justifications for democracy. Voting enables the people to exercise political choice. But the principle of political freedom also has implications for international migration. The same logic that justifies giving people a right vote at the ballot box also implies that they should have a right to vote with their feet. This is particularly true of people living under authoritarian governments, where foot voting is often the only feasible way of exercising any political choice at all. But even for those fortunate enough to live under a democracy, the right to migrate elsewhere is an important aspect of political freedom. In both cases, obviously, the right to emigrate is of little value unless there is also a right to immigrate to some other nation…. Although the democracy has spread rapidly in recent decades, the majority of the world’s population still live in undemocratic states…. A Germantown mother and another woman accused of killing two toddlers and trying to kill two other children believed that they were releasing demonic spirits that had possessed the siblings, Montgomery County police said Saturday. The two dead children — a boy, Norell Harris, 1, and a girl, Zyana Harris, 2 — were found Friday morning on their mother’s bed in a Germantown townhouse. Both had been stabbed repeatedly, police said. A sister, Taniya Harris, 5, and a brother, Martello Harris, 8, were seriously injured but are expected to survive. Police said the women thought that they were performing an exorcism, although it did not appear they had followed any ritual…. Police identified the women as Zakieya L. Avery, 28, the mother, and Monifa Sanford, 21, who lived with the family. Each has been charged with two counts of first-degree murder and two counts of attempted first-degree murder…. Avery, who has received mental health counseling, moved twice in recent years — from Western Maryland to Ohio and then to Montgomery, according to a minister whose church she attended. A relative said she had separated from her husband. Writings on her Facebook page suggest that she believes in God and fears Satan…. In the townhouse community where Avery lived … at least one neighbor saw signs of possible trouble Thursday night. He spotted a child alone in a parked car and called 911, police said. As officers were on the way, two women came out of Avery’s townhouse, told the neighbor to mind his own business, took the child and went back into the home, police said. 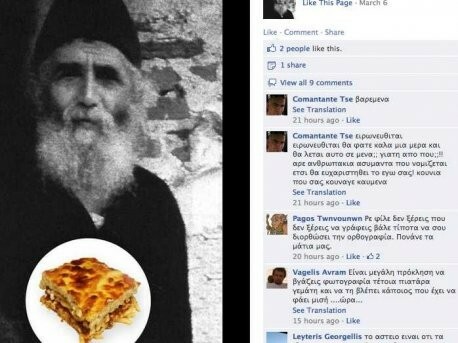 A man who created a Facebook page poking fun at a revered Greek Orthodox monk has been sentenced to 10 months in prison in Greece after being found guilty of blasphemy…. Filippos Loizos, 28, … used a play on words to portray Father Paisios as a traditional pasta-based dish [pastitsio -EV] …. Father Paisios, who was revered for his spiritual teachings and was said by some believers to have powers of prophecy, died in 1994. Loizos had appealed against the ruling and would not be jailed before his case was heard by a higher court, Kleftodimos said. My thanks again to the VC for lending me the podium this week to talk about The Conscience of The Constitution. I hope you’ll join me—in person or online—on January 30, when I speak about the book at the Cato Institute’s book forum. Then I’ll be participating in February’s Cato Unbound to discuss the debate over “judicial activism” (which takes up chapter 5 of my book). If you enjoy The Conscience of The Constitution, you might also be interested in my other books, The Right to Earn A Living: Economic Freedom And The Law, and Cornerstone of Liberty: Property Rights in 21st Century America (on sale now for only $7 at the Cato store). I mentioned in a previous post that Progressivism has a curious definition of “democracy” that largely takes the form of unaccountable administrative agencies wielding enormous power to regulate people’s behavior. Perhaps the most extreme example of administrative power—the Independent Payment Advisory Board, or IPAB—is the subject of the latest constitutional challenge to Obamacare to be heard by a federal court of appeals. The Ninth Circuit will hear the case in a special session in Las Vegas on January 28. I have a few upcoming talks that are open to the public and may be of interest to VC readers. On January 21, at noon, I will be speaking at the National Constitution Center’s “Affordable Care Act Town Hall” with Simon Lazarus of the Constitutional Accountability Center. Jeff Rosen will moderate our discussion of continuing legal controversies surrounding the ACA and its implementation. This podcast offers a bit of a preview. Registration details here. On January 30, at noon, I will be speaking on ACA implementation before the Cleveland Lawyers Chapter of the Federalist Society. Details to follow. On January 31, at noon, I will be speaking on “The Conspiracy Against Obamacare: How Academic Bloggers Influenced the Legal Battle Over the Individual Mandate” at the Public Affairs Discussion Group, sponsored by the Center for Policy Studies at CWRU. Lawyers who worked for years — ultimately successfully — to clear the names of U.S. citizens of Japanese ancestry who were convicted of violating government detention policy during World War II are trying to persuade the Obama administration to join in wiping off the books the Supreme Court rulings of that time, upholding those detentions. The most famous of those rulings – often reviled – was the 1944 decision in Korematsu v. United States. The lawyers did so in a letter last week to U.S. Solicitor General Donald B. Verrilli, Jr., attempting to shape the government’s response to a new Supreme Court appeal that attacks the Korematsu decision. They want the government to formally repudiate that precedent, and tell the Court that it is no part of the justification today for detention of U.S. citizens during the war on terrorism. The new case is Hedges v. Obama (docket 13-758), an attempt to revive a constitutional challenge to Congress’s recent support of presidential power to detain suspected terrorists….